While the idea of the holidays being connected isn’t a new idea (see The Nightmare Before Chrismas (1993) for another take on it), there is something intrinsically interesting with making the respective figureheads of their representative mythos come together in an Avenger-esque fashion against a common enemy. Rise of the Guardians (2012) certainly does a good job of this, even if only two of its characters have anything to do with holidays at all. In its essence, the fanciful characters from our childhood banding together to fight evil personified is based on the belief that we all have something to believe in. What I particularly like about Rise of the Guardians is the surprising depth of the characters chosen to fight for the belief of all children around the world. From a Russian-themed Santa Claus to the Australian Easter Bunny (expertly voiced by Alec Baldwin and Hugh Jackman, respectively), these added details to beloved childhood figures just adds to their personalities. Even the Boogeyman’s ability to hide and utilize shadows merely emphasizes that each of these characters has abilities and strengths commensurate to their basic attributes, thus fleshing them out into well-rounded characters instead of just 2-dimensional bedtime stories. Because of these colorful and unique characters, their interactions in this interesting plot were merely accentuated by the imaginative artistic style that Dreamworks animators have used for years. That being said, the human children characters looked quite ugly, so I can’t completely give the team full marks for their effort. Still, the visuals of the main characters were used to create a fanciful and fun world which was expertly contrasted by the “under the bed” realm of the Boogeyman. And while this film might not necessarily be a “Christmas” film (it’s events actually take place closer to Easter), I think it’s a good counterpoint to other “cold” animated films like “Frozen”, especially for the young boys who might not be interested in Disney princesses. 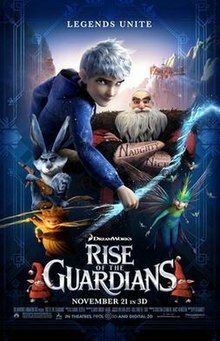 An action-packed film with great, well-known characters and stunning visuals, I give Rise of the Guardians 4.5 stars out of 5.